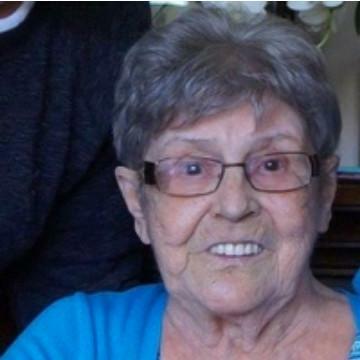 It is with heavy hearts that the families of Mary Lavina Brake nee Parsons announce her passing at the Bonne Bay Health Centre, in Norris Pt., NL, on Thursday, January 3rd, 2019, at the age of 83 years. Leaving to mourn with fond and loving memories her children; Hilda (Freeman) Murrin, Susan Brake (Aubrey Lee), Elaine (Derek) Brown, Millicent Barker, Shelley Roberts, Shawn Brake (Donna Gavin), Derek Brake (Kristina Budisa), and Joseph Norris (Doreen), her 18 grandchildren, 38 great-grandchildren, and 2 great-great-grandchildren, her siblings; Harvey Parsons, Noble Parsons, and Daisy Coughlin, mother’s special friend; Lilly Payne, and her home care worker; Shirley Smith, mother was predeceased by her husband; Valance Brake, her partner; George Clarke, her parents; Lucy & George Parsons, her sisters; Ruby (Jim) Barnes, and Rosie (Don) Parsons, her sons-in-law; Clyde Earle, Mike Barker, & Joe Hovey, & her sisters-in-law; Ivy Parsons and Valsie Parsons. The family will be receiving family and friends at The Church of The Epiphany, in Woody Pt., NL, on Saturday, January 5th, 2019, from the hours of 2-4 & 7-9 pm, and continuing on Sunday, January 6th, 2019 from the hours of 2-4 & 7-9 pm, where also the funeral service will take place on Monday, January 7th, 2019, at 2:00 pm, with Deacon Francis Elgar officiating with the burial to follow at the family plot at the Anglican Church cemetery in Trout River, NL. To sign the guest book or send a message of condolence please visit our web page at www.parsonsfuneralhome.com. The funeral arrangements have been entrusted to Parsons Funeral Home & Chapel 63 North Main Street, Deer Lake, NL.